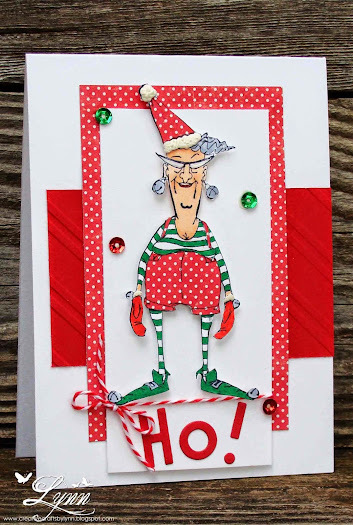 Creative Crafts by Lynn: Merry Ho, Ho, Ho! I had such good intentions back in January to start making Christmas cards early this year! I guess July (almost) is early enough. Going to have to be anyway! Meet Eunice! She's over at Art Impressions and I love her. One of these years I'm going to dress up just like this for Christmas - and scare everyone to death! At least she looks like she's having fun. Then again, maybe she dresses like this all year long! Scary! I colored her with Copics. did a little paper piecing and added the sequins. The "Ho!" was created with an alphabet die. I'll enter this in the challenge at Art Impressions (inspiration sequin). We had a neighbor that looked like this. Shudder. I was too young to know if she was nice or not. Scared the bejeebers out of me. She is more fun on the card. A fun Christmas card Lynn. Great job. I absolutely love Eunice in her elf suit! What a fabulous holiday card, Lynn! Awesome paper piecing! LOL! I think she is smiling cause her bloomers are hiked up so high! Great card, Lynn! Please take pictures if you dress up! Holy Smokes!!!!!!!!! This is too fun. I am still laughing at Irish Cherokee's comment. Eunice has to be in pain with those high pants/bloomers. If you ever dress like that (and I hope you do), we want a photo. Super fun card, Lynn. This is so amazing, fun and unique take on Christmas, love it! hahahah.... Eunice is a hoot and I love the way you designed this card. Rofl this is absolutely brilliant Lynn, I love it!! Such a fabulous Christmas card. Love everything on it. Make sure to take a picture of yourself when you put this outfit on. I've got to see that one. LOL She is really something and great piecing by the way. Love those little sequins. What? You mean you don't dress like this? Absolutely fabulous and such fun, gotta love Eunice! Oh Lynn - never loose your sense of humour - I am still having a giggle over this! You have really rocked this card. What a fun card! She made me giggle...she is a cute old bat! Haahaa Lynn she is fantastic! Love this, brilliant design as always. OMGosh Eunice is sooo cute Lynn, what a fun image!! I love the paper piecing and sequins, fantastic fussy cutting too! You make the cutest cards! Always such a pleasure visiting your blog...great job with the paper pieceing. Oh Lynn what a great design those glasses always make me think of my mom she wore those cat glasses when I was a kid. 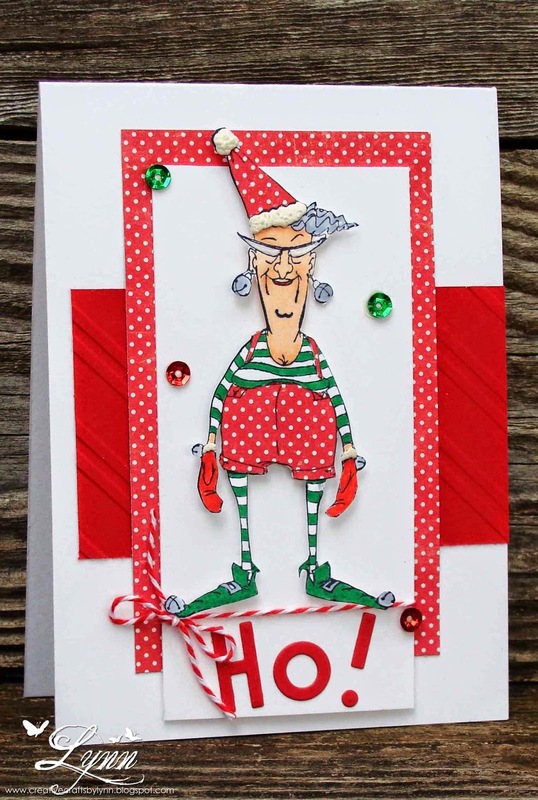 What a fun image, and I love Christmas cards with sequins! She is my inspiration! Again - sequins! I must tell you I thought of you yesterday as I was digging for something. I found a bag of sequins! I immediately thought....I gotta tell Lynn! I really love her paper pieced outfit - it is perfectly merry! Here's an idea. Some day you and I will actually meet. We will know each other by both of us wearing THIS 'classy' outfit! I love it! So merry and jolly! This is a perfect Christmas card. Eunice is such a scream. I love her outfit. LOL, be sure to show us a picture when you dress like Eunice! What a fun Christmas card! hahaha!! This is so fun! That is the craziest looking Ho, I've evah seen! LOL! Great card! Thanks for the laugh. Super cute, Lynn...she gave me a giggle with her wild and crazy outfit...I think I'll wear one of these, too!!!! I LOVE her! Everything on this card goes so well together and she is quite festive! I think we need a photo of you dressing up like her! BTW- July is the perfect time to start Christmas cards-helps us keep our cool!